I recently got the PowerWave 7.5 stand to complement my new Galaxy S9+. I knew getting this phone it uses USB C cables and also had wireless charging, after reviewing the powerport 5 I was sold on wireless charging and sought out to continue using it when I'm at home. 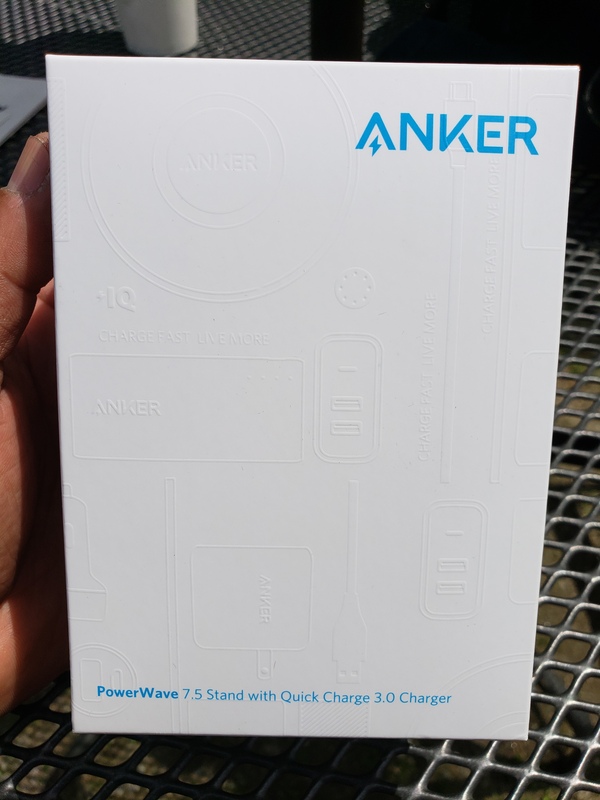 The powerwave comes in the standard blue and white packaging, one thing I loved is that the packaging was embossed so you can see some of ankers product lineup. 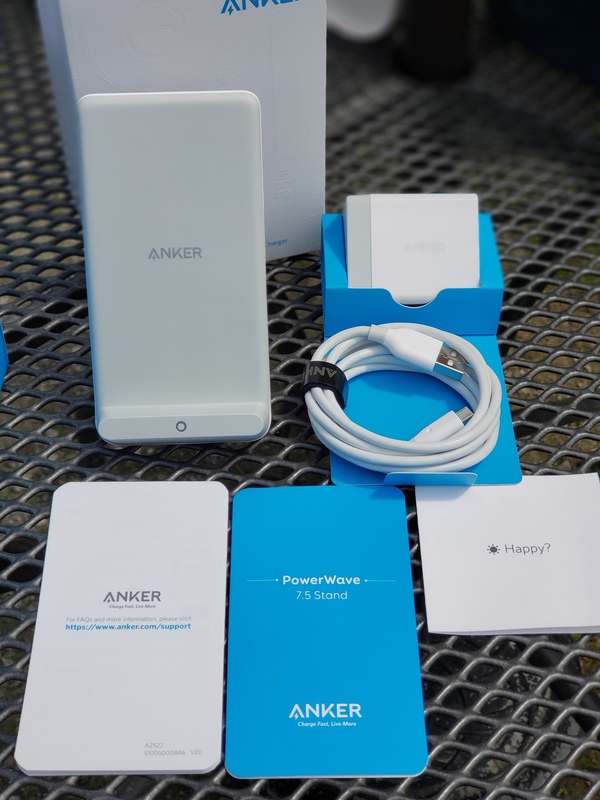 Inside the white box is a blue box that holds the stand, the quick charge 3.0 wall plug,and a anker micro USB cable, the standard happy/ not happy cards, instructions on various languages and a quick guide so to speak. One of the things the instructions say to do, is make sure you use the included quick charge plug to power up the stand, I tried to use different plugs but none would power the stand like the charger it comes with, so make sure to use it together. Now when I tested the powerpad 5, the phone took almost 3 hours to charge and this was at a lower wattage...but, with the powerwave my phone took just under 2 hours to fully charge. In testing the times and charge rate I was able to learn that the phone never once got hot to the touch and even the screen was cool to the touch. Thanks to ankers higher charge rate at 10watts since I'm using a Samsung phone( iPhones charge at 7.5 W) and the use of an Internal charging fan. With Ankers proprietary tech, if the phone overheated the thermal sensor will kick in thus triggering the fan to turn on, once temperatures drop the fan turns back off until its registered as being needed again. The higher charge rate of this stand compared to the pad is significant enough that it's worth having and using bedside or even at an office desk. The ability to just set it and forget it, ready to go as needed is a great plus. The convenience of using a stand over the pad is significant, this stand has dual charging coils so it will charge your phone in both vertical and horizontal orientations. It was also able to charge my phone with a Zizzo case on it, I charge with and without the case and only noticed a 1 to 2 minutes changing difference. My phone also charged similar times in both vertical and landscape orientations. Charging time via the adaptive charging plug that came with my phone was around 100 minutes or so. So wireless is still not as fast as a regular plug, but still quicker enough to warrant without much of an issue. So if your in the market for a wireless charger,I would recommend this as it works great for me. Yea when I got it I told my wife she can have the wireless pad, I prefer the stand. I just wish it came in black as the white stands out and looks to get dirty easier, but it is easy to find in a dark room so i know I can easily set my phone on it without issue. It does get dirty easier - or rather, we see the dirt earlier than we would on black - but it also cleans easy, at least the pad. I prefer the pad for my bedside table, but I will go with the stand for my office! If I'd have such a phone I'd use such a charger. As I don't, I like to see others which are happy with it. Sharing good news with happy elmo is always a pleasure. Great job on the review. Love the nice clean looking of it. Nice review! I've been thinking about getting a S9 or the S9+ in the next few weeks. Have you tried to wireless charge with a case? I've read that a few of the higher end cases are certified to work with wireless chargers. Unless your case is extremely thick, or the case is made from a material that doesn't enable the current to pass, you should be OK. I have the PowerWave 7.5 Pad to recharge my iPhone 8 with a silicone case, and it starts recharging even before the phone touches the pad - I guess it's the same with the stand. Yup, I mentioned it above I was able to charge with my zizo case on it. The s9+ is proven to be a great phone, happy I brought it, you won't be disappointed. Yeah, Somehow I missed that piece about the case. Great review I agree the white model look pretty nice. I want to get one to fast charge and move my 5watt powerpad 5 to night stand for over night charging. Great job Rob. I’ll be getting one of these beauties. Great choice, my 5w powerpad is now my wife's as she often sets her phone down playing music. She can keep her phone charged and I use this on my side of the bed because when I'm not working I am often watching movies to fall asleep. So I just set my phone in landscape mode and it charges while I watch my movies...it does charge slower when the screen is on, but it still charges pretty darn quick considering. Another great review, @elmo41683! Thanks for posting. The packaging is beautiful. It almost reminds me of an Apple unboxing. It's clean and professional. 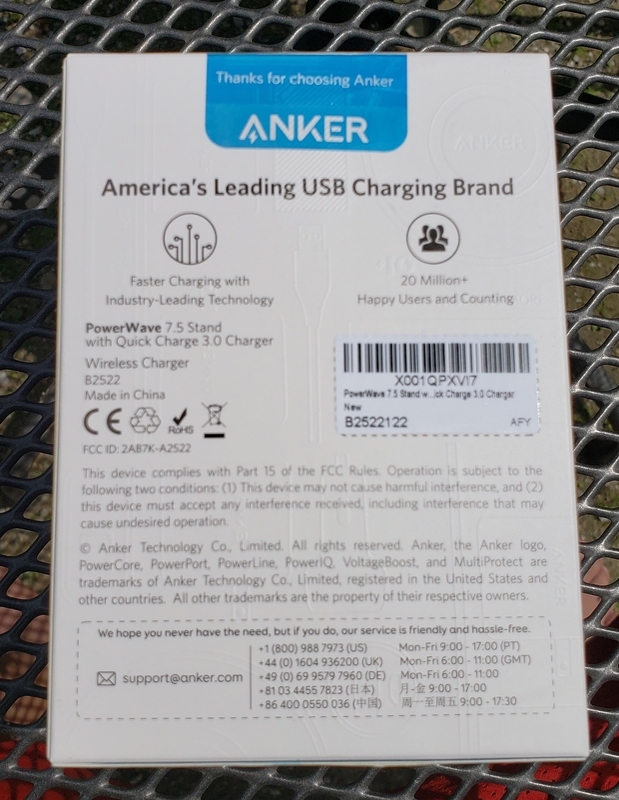 Great charger and a great review. Thanks!